The idyllic country village of Bamburgh, ancient royal seat of the kings of Northumbria, is set in one of the most breathtakingly picturesque coastal regions the country has to offer. Its enormous beaches go on for miles and the area has featured in many epic films. With trips to the Farne Island Group so close at hand from nearby Seahouses, Bamburgh is certainly an essential place to visit. Furthermore, Bamburgh's tranquil and rural setting (just off the beaten track of the busy A1 trunk road) will be particularly appealing to those seeking a base from which to explore north Northumberland. The village is dominated by views of the Castle. You may find it interesting to note that it is believed that the road you are travelling on was probably covered by the North Sea in the 7th century! No trip to North Northumberland is complete without a visit to the Farne Islands. You can sail there from nearby Seahouses - just a few miles along the coast road. 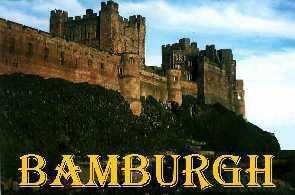 WHAT BAMBURGH HAS TO OFFER!